Blyth Spartans bounced back to winning ways with a comfortable victory over Frickley Athletic on Tuesday evening at Croft Park. Luke Armstrong grabbed a brace, Robbie Dale and Sean Reid tapped home simple goals and Matthew Pattison was able to nod in from close range to seal the win. Waide Fairhurst pulled one back for the visitors just before the break but any hopes of a comeback were extinguished when Nathan Valentine was shown a straight red card on the stroke of half-time. Spartans made two changes to the side that lost at Sutton Coldfield on Saturday with Damen Mullen and Pattison replaced by Jordan Laidler and Adam Wrightson. Blyth attacked from the first whistle and their first attack gave them the lead. Good work down the left wing from Dan Maguire saw him find room in the box, but his shot was blocked by Malkowski in the Frickley goal before an attempted clearance by a defender rebounded off Armstrong and into the net. If Frickley had arrived with a game plan to try and absorb pressure and try to play counter-attacking football, then the goal after 40 seconds ended that plan. Frickley suffered a further setback after only six minutes when Mcauley Parkinson was forced off after an innocuous clash with Dale. The right back was replaced by Julian Lawrence. Frickely had half a chance to equalise when a cross was headed clear only as far as Nathan Valentine on the edge of the box, but his volley was saved comfortably by Paul Woolston. On 13 minutes, Reid chased a through ball and looked for all the world to have a one-on-one with Malkowski, but a superb last ditch challenge by Lawrence robbed him of the chance. The tempo was just slowing slightly when Frickley reminded their hosts that they were still in the game when Luke Mangham drove in from the right before flashing a left footed drive over the bar. The miss proved costly on 22 minutes when a calamitous piece of play gifted Blyth their second goal. A back pass was chased by the terrier-like Maguire and as Malkowski attempted to clear the ball bobbled and it dropped for Maguire 14 yards out. He had the composure to cross for Armstrong to grab his second as he chested it down and sumptuously volleyed home. Blyth continued to attack with real intent for the rest of the half as Maguire, Reid, Dale and Adam Wrightson all had chances to extend the lead as the interval approached. Despite their dominance, the next goal came from the visitors on 41 minutes. A free kick from halfway was flicked on and Fairhurst was able to guide the ball home at the near post. The turning point came just a couple of moments later. There had already been a couple of challenges between Valentine and Dale that the referee was happy to let go, but the latest resulted in a red card. Valentine turned to see where Dale was before launching an elbow into the back of Dale’s head as the players competed for an aerial ball. The referee had no hesitation in brandishing the red card to Valentine despite his protestations. The second half began with Blyth on the front foot as they had spent most of the first half. Armstrong saw an effort blocked by Malkowski and in trying to reach the rebound was pulled to the floor by Waters. The referee pointed to the spot and allowed Dale to try and restore the two-goal lead. The effort was destined for the bottom corner but a fantastic save low to his right from the Polish capped Malkowski kept it out. Just before the hour Blyth were able to regain their two-goal advantage as Frickely’s defence were sliced open and Maguire nipped in behind and rolled the ball across the box for Dale to tap home. Two minutes later and Spartans added another to their tally; once again the terroriser in chief was Maguire as he charged into the box. His effort deflected towards goal and seemed to be heading in until it was cleared on the line but straight to Reid who from two yards out was able to poke the ball home. By this point it was a constant stream of attacks from the home side as Frickley looked beleaguered by the pressure being applied. On 66 minutes Armstrong raced through looking for his hat-trick goal, but his effort was well parried by Malkowski. Maguire was first to react to the loose ball but another last ditch tackle from Lawrence prevented him from finding the back of the net. Armstrong was replaced by Pattison on 75 minutes but the former was still ruing more chances he had to grab the match ball. Twice he saw efforts blocked on the line by desperate defending and also blazed over when well placed. Frickley’s first effort of the second half came in the 80th minute, Fairhurst made room down the right before dragging a low ball across goal. He may have anticipated a teammate arriving at the far post but there was not on this occasion. David McTiernan, who had earlier replaced, Reid, came close to grabbing his first goal in Spartans colours as his volley from the edge of the box was deflected towards goal but tipped over the bar. Pattison rounded off the scoring in the 90th minute. A through ball released the lightning quick Wrightson who rounded the keeper but despite being forced wide, he dinked the ball into the back post area where the arriving Pattison nodded home. Every single player in a Spartans shirt worked tirelessly as they maintained their ten-point lead at the top of the table. With ten games to go the destiny of the title is firmly in their own hands. On Saturday, Blyth make the trip to Derbyshire to face Buxton. 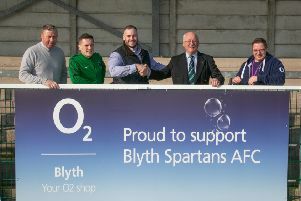 Blyth Spartans: Woolston, Cartwright, Watson (Liddle 72), Laidler, Pell, Buddle, Wrightson, Reid (McTiernan 67), Maguire, Armstrong (Pattison 75), Dale. Subs not used: Hooks, McHugh.